1. When I showed my pictures from my trip to one of the senior ladies at the Korean Center, she puffed out her cheeks and said "You look fat!" Then she let out this long, evil laugh. I told her it was rude, but she just kept saying it over and over and pointing "You look fat! Hahahahahaha Vely fat!" I tried to tell myself that she probably just meant "healthy," but this woman is one of my best students. She comes every day and her English is pretty good. I hate it when you think someone is really cooperative and hard-working and then you realize that they just have mild dementia. I had the bilingual social worker come translate because I'm not above getting upset if some old lady calls me fat. It turns out that she meant that I looked fat IN THE PHOTO but that I wasn't fat in real life and she thought that that was funny. And apparently, in Korea, it's rude to say that someone looks nice in a photo because it implies that they are ugly in real life. So Mrs. Bae is actually sane, but I still gave her a harder assignment today than I usually would have because she laughed so evilly. 2. 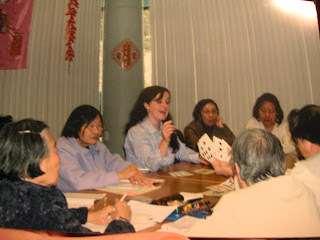 I got some pictures back from when I taught the Chinese ladies how to play "Go Fish." "Give me all your ____" and "Go Fish"
Lin Ruie Fen (on the left) is all "She's got snake eyes!" 3. 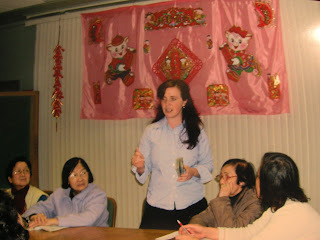 Today, I taught a small Chinese class at a senior residence that also houses American seniors. American seniors are my least favorite, cause in California they're not even cute or cool like they are in Georgia. They eat canned spaghetti and hate foreigners ("they're taking away our spaces!). Plus, the old men are creepy. I'd rather walk past a gigantic construction site in a mini-skirt than walk to the bathroom if a bunch of old Californian men are in the hallway. Today this man WITH A WALKER approached me before class. He's all, "I saw you drawing some pictures before of a pig and a cow. I'm an artist and I'd like to help you." I said, "Thank you. That's great. What your name?" "Oh, so, do you pantomime?" "Yeah, a little...You don't have to speak another language to teach English"
"Oh, well, I just got my new teeth yesterday." "Yeah, I'm ready to bite into things, like an apple, or maybe some young girl's neck if you know what I mean."